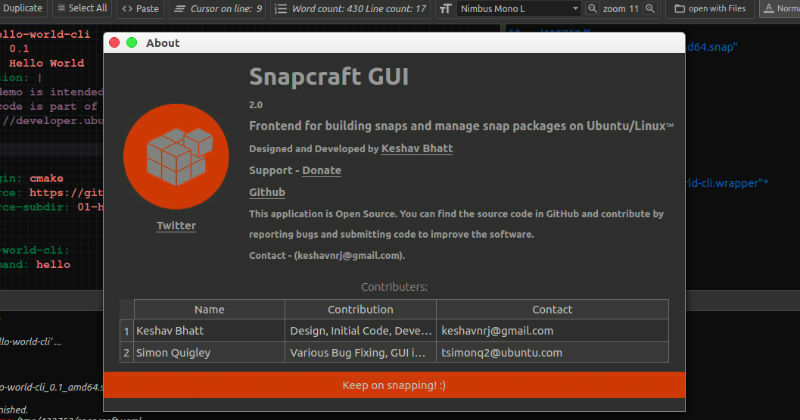 How to install Snapcraft GUI 3.0 on Ubuntu 16.04. Snapcraft-GUI is a graphical user interface to create snaps using Snapcraft on Ubuntu Systems. A Snap is used to package any app for every Linux desktop, server, cloud or device, and deliver updates directly. Snaps are faster to install, easier to create, safer to run, and they update automatically and transactionally so your app is always fresh and never broken. Snaps aim to work on any distribution or device, from IoT devices to servers, desktops to mobile devices. Once installed, open the Snapcraft GUI from Ubuntu Dash or Terminal.